UU A Way Of Life: Retributive or restorative justice? The King's justice, retributive justice, not only often misses the mark, it becomes criminal in and of itself because of the injustices it perpetrates against offenders, victims, and the community it professes to serve. The criminal justice system is very self serving and serves primarily the requirements and expectations of the primary stakeholders in the system itself, the judge, district attorney, defense attorneys and politicians who have a stake in the results the system produces. Because of these special interests the motivation and intention is to win in what has been set up as an adversarial contest, not to determine the truth or repair broken and injured relationships. However, as we have learned increasingly over the last 25 years, there is a better way to do justice and the term that has been applied to this way is "restorative justice." The purpose of restorative justice practices is to determine what the harm that was done, and how best to repair the harm. The primary stakeholders in the restorative justice system are the victim, the offender, and the community. Crime is defined, not as a disturbance to the King's peace and civil rule, but rather as a violation of reciprocity of relationships through the harm that was done. The perpetration of this harm generates obligations to the offender, victim, and the community to put things right, to repair the harm. 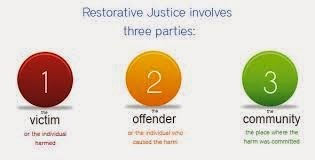 Howard Zehr in his book, "The Little Book Of Restorative Justice", points out four key factors in the difference between a retributive and a restorative criminal justice system. First, the retributive criminal justice system defines crime as a violation of the law and an offense against the state while in the restorative justice system crime is defined as a violation of people and relationships. Second, in the retributive criminal justice system the purpose is to determine guilt and to punish while in the restorative justice system the purpose is to determine the nature and extent of the harm and to ascertain the obligations for repairing the harm and restoring right relationship. Third, in the retributive criminal justice system justice is defined as placing blame, determining guilt, and imposing pain (vengeance) while in the restorative justice system, justice is defined as involving the victim, the offender, and the community to determine harm and developing a plan to put things right by repairing the harm. Fourth, the central focus of the retributive criminal justice system is assuring that offenders are punished, and the focus of the restorative justice system is to address victim and community needs by holding offenders accountable for repairing the harm they have caused. The second principle of Unitarian Univeralism is to affirm and promote justice, equity and compassion in human relations. It gives no clues or instructions on how to do this. "The devil is in the details" as the slogan goes. It sounds good in theory, but what does it look like when the rubber hits the road as they say. As I have gotten more involved in a prison ministry mentoring men in jail, and working in prisons and jails, it has become very apparent to me that our criminal justice system is criminal and creates many unintended negative consequences. Recidivism rates, in general, because it changes if we consider subgroups instead of the general population, is 65%. In other words, two thirds of the people we incarcerate in our society will return to prison after their release. Is it because they are bad people, or because our system is broken and doesn't work? I know of no other business or service organization that could survive and succeed with a two thirds failure rate. However, too few Americans question the failing system which we support with our tax dollars. Jesus and many of his apostles were incarcerated and executed in the early days of the Christian church. Jesus seems to have understood the injustice in the retributive criminal justice system. He cleverly convinced the pharisees not to execute the adulterous women even though she was guilty under the law. Jesus was very much into healing and restoring broken relationships and His concern was always for the person not for the State or the ruling class of the day. Jesus counter-intuitively said we should love our enemies not blame, assign guilt, and punish them. We humans have been very slow in learning the lesson that Jesus was trying to teach us over 2,000 years ago. His life and moral vision and spirituality were solidly based on justice, equity, and compassion, and while cultural Christians profess to believe in Him and His teachings, you can't tell it by the criminal justice system they have created and support in the United States of America. Not many people are familiar with restorative justice and its practices in the United States. It has gained much more traction in countries like New Zealand, England, and to some extent Australia. I am surprised that more Unitarian Universalists haven't embraced it because it is a model of justice that fits much better with their second principle. The criminal justice discourse in the United States is so self serving that restorative practices are perceived as a huge threat by those players in the current system because while it provides better justice and satisfaction to those it serves there is no money in it.